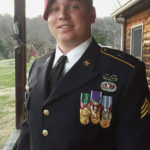 Arnold, Missouri native Todd A. Nicely was 26 years old when his life changed forever on March 26, 2010 while participating in combat operations against Taliban insurgents in Afghanistan. This young man was a Corporal in the Marine Corps, leading a squad of 12 infantry Marines with 1st Platoon, Fox Company, 2nd Battalion, 2nd Marines from Camp Lejeune, North Carolina. As a Corporal, a non-commissioned officer of Marines, he was responsible for the training, welfare, deployment, and every aspect of the lives of his Marines, 1st Squad. 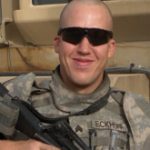 At 26, he was called the “old man” of the squad because in addition to being the Squad Leader, he was also much older than the majority of young men in his squad, most were on their first combat tour (Nicely already had done a combat tour in Iraq back in 2008) and were 6-8 years younger. While returning from a routine “security patrol” in the Taliban infested area of Afghanistan that his battalion found themselves stationed, the Squad was preparing to cross a bridge. Like the good Marine leader he is, Corporal Nicely, was “leading from the front” not just figuratively, but literally, he was walking point (he was at the very front of the squad). As he began to cross the bridge, he stepped on a pressure plate mine. The massive blast from the explosives blew him into the air. Nicely does not recall hearing any sound but does recall hitting the ground after the explosion. His first thought was “Aw God, What Happened?” As the realization of the enormous blast that he just endured and the massive injuries he suffered began to sink in, he had two thoughts. One was “just keep breathing so you can get back to your wife.” The second was, after letting out a few blood-curdling screams, he became concerned about the effect that his screaming might have on the Marines of his squad and so according to Todd he decided to just “shut up” and “stay strong.” Think about that and let it sink in for a minute. He had just endured an incredible explosive blast, suffered massive injuries and his two thoughts were about getting back to his wife and not frightening the Marines that he was responsible for by his screams. If that is not a hero, the word has no meaning. Todd immediately had a realization that he had been blown up “pretty good” (his words), but he certainly did not realize that the blast had blown off all four of his limbs. On that fateful day in March, 2010, Corporal Todd A. Nicely, United States Marine Corps, became one of only 2 other modern day veterans that have endured battlefield injuries resulting in the loss of all 4 limbs (both legs and both arms) and survived. But when you meet this incredible young man, you will quickly understand why he had the ability to survive such an incredible challenge-he has an indomitable spirit, infectious enthusiasm, positive outlook, and a strength of mind and character that is second to none. After being medivaced and returned to the United States, Nicely began his surgeries and treatments at Bethesda Naval Hospital near Washington DC. Since then he has been transferred to Walter Reed Army Medical Center where he continues treatment, therapy, surgeries, and learns to use his prosthetic legs and arms. His mother Julie Stanbrough is with him constantly. And the Joshua Chamberlain Society could not be more proud to announce that JCS will be with Corporal Nicely and his family from now on as well. Todd Nicely is our third JCS Hero and we are absolutely thrilled that he has agreed to become part of our JCS family.